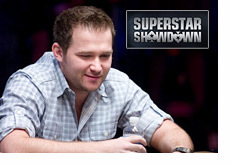 Coming into the 2011 World Series of Poker nobody questioned Eugene Katchalov’s poker playing skills, with millions in live tournament earnings and an excellent record in track record in cash games, Katchalov is considered one of the game’s preeminent players. The one thing that was missing from Katchalov’s resume was a WSOP bracelet, something he remedied early on in the 2011 WSOP by winning the $1,500 Seven-Card-Stud tournament, and now it appears a second WSOP bracelet may be in the cards on Sunday as Katchalov finds himself at the final table of the $1,500 Limit Holdem Shootout event. Katchalov, and the other nine remaining competitors who have won their Round 1 and Round 2 tables, will all start with the same amount of chips, and in essence will be playing a 1-table Sit & Go tournament for the coveted bracelet. This entry was posted on Sunday, June 26th, 2011 at 7:31 am and is filed under Poker News. You can follow any responses to this entry through the RSS 2.0 feed. You can leave a response, or trackback from your own site.